If you are looking for a quick and effortless solution for all your grooming requirements, the Philips OneBlade QP2520/30 Hybrid Trimmer & Shaver is the right choice for you. 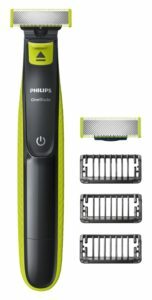 Like all other OneBlade models from Philips, this trimmer comes with an extra rechargeable blade. However, the highlight of this piece is that it comes with three additional stubble combs as well, which prove to be very handy for you. Apart from this, this trimmer comes with a lot of user-friendly and skin friendly features that are designed to provide you excellent comfort and style while grooming your hair. Trimming, shaving and drawing fine edges on your hair is no more a challenge, thanks to this innovative trimmer from Philips. Read on to know more about the features of this product. Can be used as a great way to keep your head trimmed or shaved with you want. Will not give you a super close shave but if you use it twice a week it can keep you with the blade head you desire. Very time-consuming to trim and cut long and dense beards. Not going to be for you if you want longer then a 5mm beard. The OneBlade trimmer models from Philips have received lots of appreciation from users all over the model. The QP2520/30 Hybrid Trimmer & Shaver is no exception to this rule. While its features and technology are above par, some users feel that is quite steeply priced and that there are other alternative models in the market that do a better job at affordable rates. It has 4.3 out of 5 stars with 81% over four stars, and just over 10% one star. It sells for £40 currently, and the replacement cartridges at £12 for a single or £20 for a 3 pack.